How to get a bedroom furniture set at no-cost? There are many individuals among us that want to nicely organize their newly built bedrooms but market prices are not always friendly in this age of inflation! Time to say good bye to those unreasonably high and unbearable market prices, be your own furniture setter and design at home and believe us it would not take any time if you go with pallets! 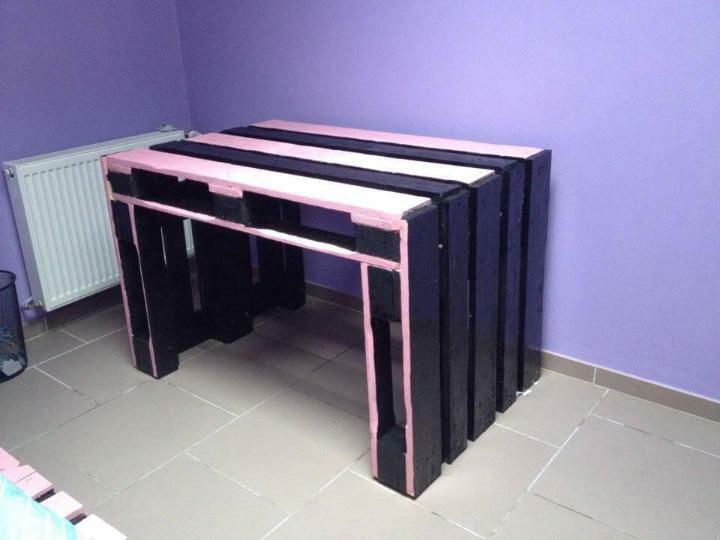 Try this DIY pink and black pallet furniture set for bedroom and renovate your bedroom on a budget! Set comes with a raised pallet-made table, a pallet media console table and a cozier platform bed with headboard! 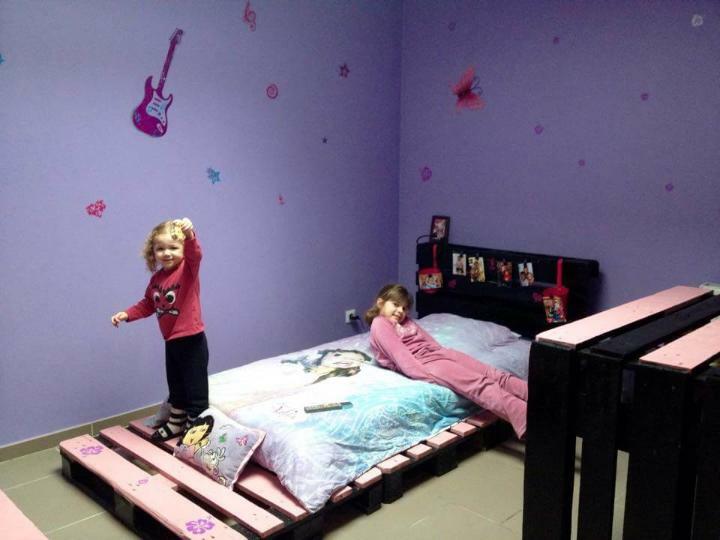 Pink color is always friendly to girls and has a lot of potential for lovely girly rooms’ decors! There is no excess use of muscle effort and nothing major to do in this project, simple align and stack the pallets perfectly to build the entire bedroom set! Just floor 3 complete skids and put one in upright position at the back for a platform bed statement, stack 2 more to build up a media stand for your display screen and support a bigger pallet board on two smaller ones to get a beauteous table design for bedroom decors and other utility functions! Install 3 whole pallet in U shape to get this amazing table design with storage cubbies to hold your files and magazines! Stain the table in black and use the pink paint overlay to get a girl-friendly look of it! 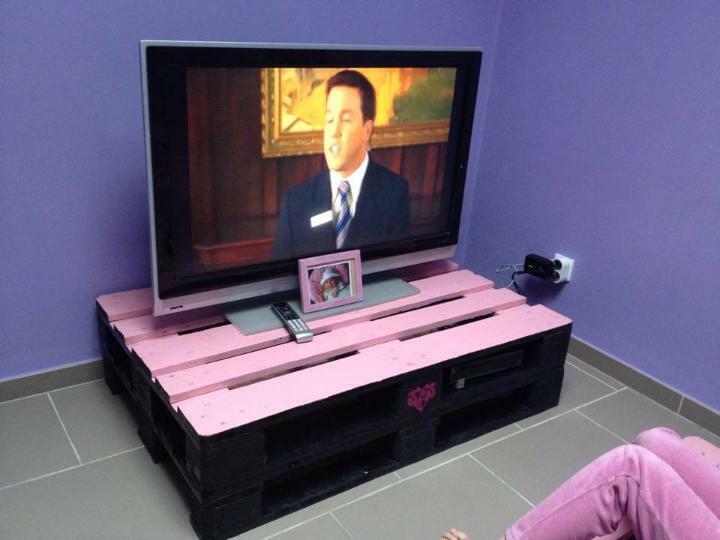 Stack two of bigger pallet boards over one another and earn a bedroom media stand to hold your big LCD TV screen! Media items and other items of decors and interest can placed easily inside the front opening for a secured type of storage! Have you ever thought that 4 complete pallets can be installed to a cozier bed design? If not yet, then here is inspiration for that and start collecting your pallets now to get a toddler bed with accent headboard!